How many ways can you cook zucchini? I am always looking for new ones. One of my favorite types that I grow in the Ciao Italia garden is Romaneso, deep green with lime green stripes. It is firm and has a nice nutty taste. It holds its shape in cooking and is even delicious raw! 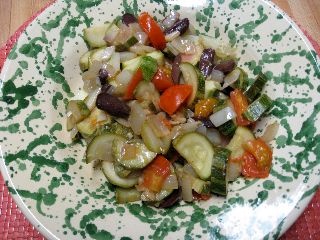 I do everything with it from stir fry to making a sauce for pasta, but I love it as a side veggie too with cherry tomatoes, olives and onions. Here is an easy recipe. I sometimes add mozzarella cheese at the end and let it melt all over. You can buy romanesco zucchini seeds from Franchi. 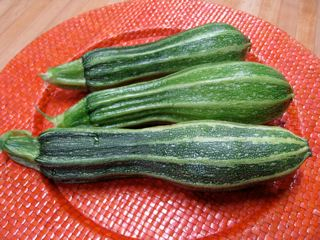 2 small zucchini, trimmed cut in half lengthwise, then into half again and quartered. Heat the olive oil in a medium saute' pan over medium heat. Add the zucchini and onions and cook until the zucchini begin to take on a little color. Do not overcook it or it will be mushy. Add the olives and cherry tomatoes and cook a couple of minutes longer. Season with salt and pepper.